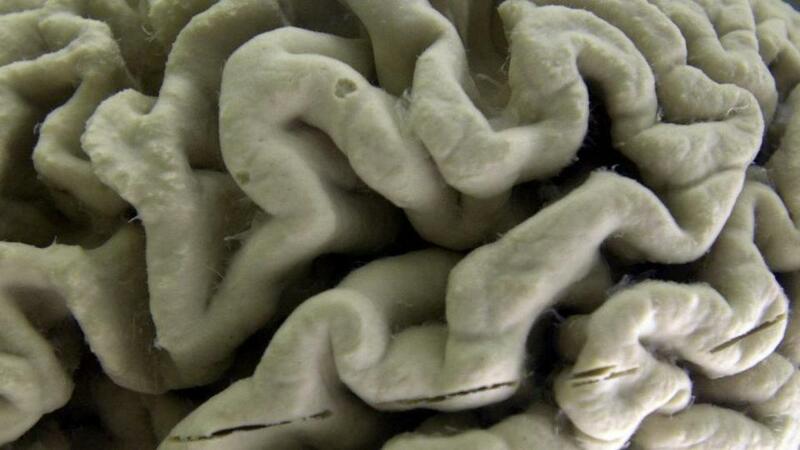 A section of a human brain with Alzheimer&apos;s disease on display at the Museum of Neuroanatomy at the University at Buffalo. Could the mind-destroying disease be prevented by treating inflammation? What role does inflammation play in Alzheimer’s disease? Scientists have been looking into that question. And a new Boston University School of Medicine study may provide another piece of the puzzle. Researchers said that possessing the ApoE4 gene has already been shown to be the major genetic risk factor for Alzheimer’s, but it wasn’t clear why some people with the gene don’t get the disease. The researchers, using data from the Framingham Heart Study, found that people with the gene who also had chronic inflammation had a dramatically increased risk of Alzheimer’s. The results were published in the journal JAMA Network Open. Researchers suggested that treating the chronic inflammation that many elderly people suffer could possibly prevent the mind-destroying disease. “It is possible that chronic inflammation . . . interacts with genetic vulnerability to increase the risk for AD,” the study said. “Since many elders have chronic low-grade inflammation after suffering from common diseases like cardiovascular diseases, diabetes, pneumonia and urinary tract infection, or after having surgeries, rigorously treating chronic systemic inflammation in ApoE4 carriers could be effective for prevention of Alzheimer’s dementia,” Wendy Qiu, a professor at the medical school who was the corresponding author of the study, said in a statement. The researchers used data from the Framingham Heart Study, which includes more than 3,000 human subjects. They looked at people who had the ApoE4 gene and examined measurements of their levels of C-reactive protein, which indicates the amount of inflammation in the body. “This study adds to the growing evidence that inflammation plays a role in Alzheimer’s disease,” she said. “These results provide support for the role of peripheral, chronic inflammation in AD, and suggest that early treatment with anti-inflammatory therapies may be helpful in staving off AD, at least in ApoE4 carriers,” Lemere, who is also chairwoman of the Alzheimer’s Association’s Medical and Scientific Advisory Council, said in an e-mail.